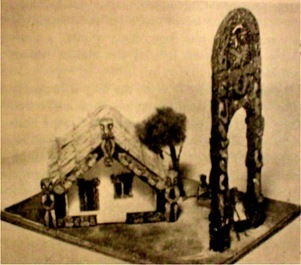 Description The Maori Assembly House was never issued by Micromodels. It was intended that there would be a three model Maori set, with marketing timed to coincide with the interest generated by a Royal visit to New Zealand. At the site there was built a new Wharenui (Assembly House/Meeting House) and a Waka Taua (War Canoe) for the occasion. In the event, the only model actually issued was set S XV, the Maori Ceremonial War Canoe. 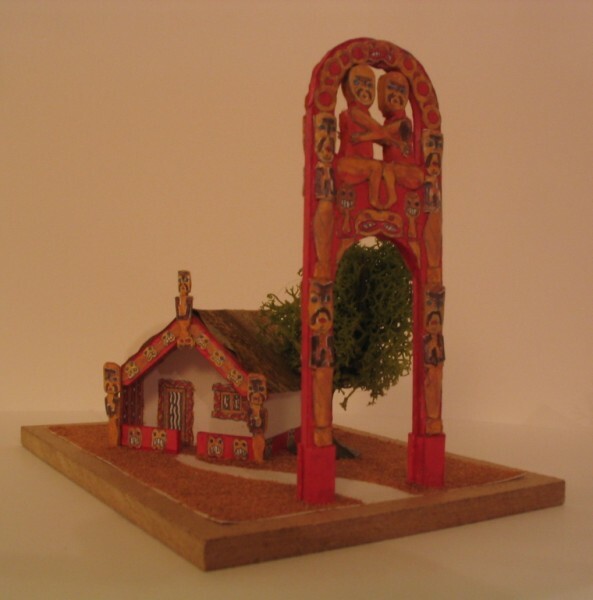 The third model, never published by Micromodels, was the Maori Village. A single sheet leaflet, slightly less than A4 size, was produced by Micromodels. It illustrated amongst other items, the Maori set as it would have looked when assembled. In the surviving Micromodels archive, the wrapper and model artwork is nearly complete. It would only need minor finishing and colouring. 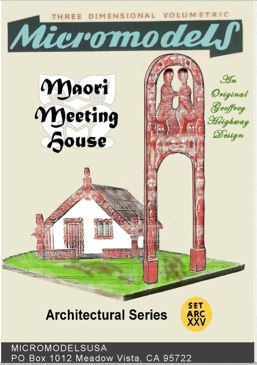 MicromodelsUSA has published this model titled as the Maori Meeting House, and used the original unpublished sketches and photos of Geoffrey Heighway’s working models, while leaving them as authentic as possible. The English collector Peter Johnson-Booth has built his own version of this model titled as the Maori Assembly House.